When Miss M came home from school a few weeks ago with a letter about dressing up for World Book Day, I suggested she just wear her princess dress. But Miss M didn’t want to, so we sat down at her bookshelf looking for a suitable character from one of her books (and one that I felt didn’t require too much effort to put together!!). 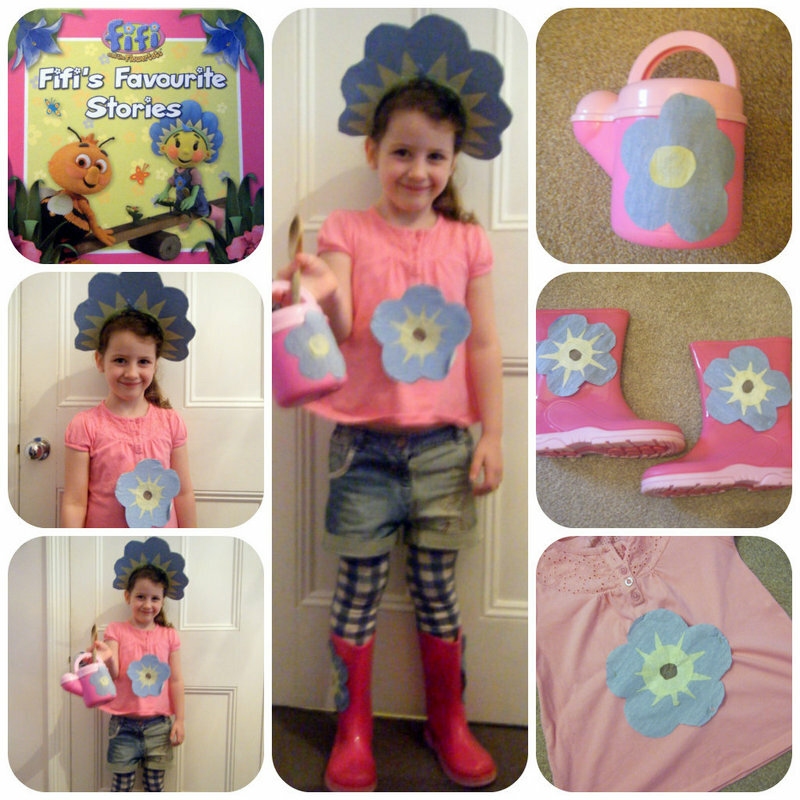 After several suggestions, we came across Miss M’s Fifi and the Flowertots book, and looking at the picture of Fifi I thought actually this is kind of simple – a pair of wellies, pink T-shirt, denim shorts and just need to make a headband. So decision made, we set to work – a cereal box for the headress and some rolls of crepe paper to decorate. Miss M loved the cutting and glueing – one of her favourite hobbies!! I cut a template for the flower shape which she drew around. We used these to stick over the Minnie Mouse on her wellies and on the sides of the watering can. And not forgetting a wooden spoon in her pocket just like Fifi always has. I thought she looked great and she was really excited on her way to school. I was quite pleased when we got there that she hadn’t just worn her princess dress as it seemed that was the choice for most of the girls in her class. And how thrilled was I when I picked her up at the end of the day to find out she had come 2nd for best dressed costume across the Early Years Unit at her school. Well done Miss M!! The Dahlicious Dress Up day at school – Roald Dahl fun! Today Miss M’s school is holding The Dahlicious Dress Up Day – a fun way to raise money for Roald Dahl’s Marvellous Children’s Charity. So the idea is to dress up as a character from any of Roald Dahl’s fantastic books and pay of a donation of £1 which goes towards the Roald Dahl day charity. Miss M was a little unenthusiastic at first not really knowing who Roald Dahl was, although when I explained that he was the author who wrote Charlie and the Chocolate Factory – a film she loves to watch, her interest grew. We had a look online at all the different titles he had written to see what she fancied dresses up as. And we decided upon a witch to fit in with his book The Witches. 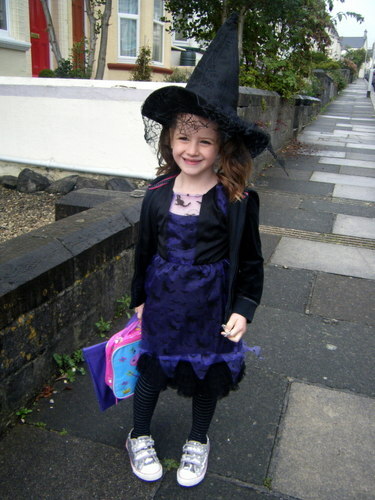 We arrived for school to find a total of ten girls in her class had chosen to come along as witches!! Amongst all the witches I spotted Oompa Loompa’s, a Willy Wonka chocolate bar (yes really!) and grandpa Joe (Charlie’s grandpa). What a wonderful display of characters and a fabulous Roald Dahl day had at by all at the school concluding in a whole school assembly for everyone to celebrate their fabulous outfits and charity success!! A lucky Black Cat for Halloween? One thing all children love to do is dress up – so when I was offered to pick a Halloween costume from the selection at Joker’s Masquerade, I knew 4 year old Miss M would be thrilled. They have an extensive choice of Halloween outfits to choose from including Skeletons, Vampires, Zombies, Witches and Ghosts. So what did Miss M choose? – A Halloween black cat. And she loved it!!! Miss M has worn this outfit for the last 3 days since we received the parcel, around the house, to the supermarket and riding up and down the street on her scooter which proves one thing – it must be very comfortable! This is a very important aspect to me as there is nothing worse than an uncomfortable, itchy outfit that your child doesn’t enjoy wearing. 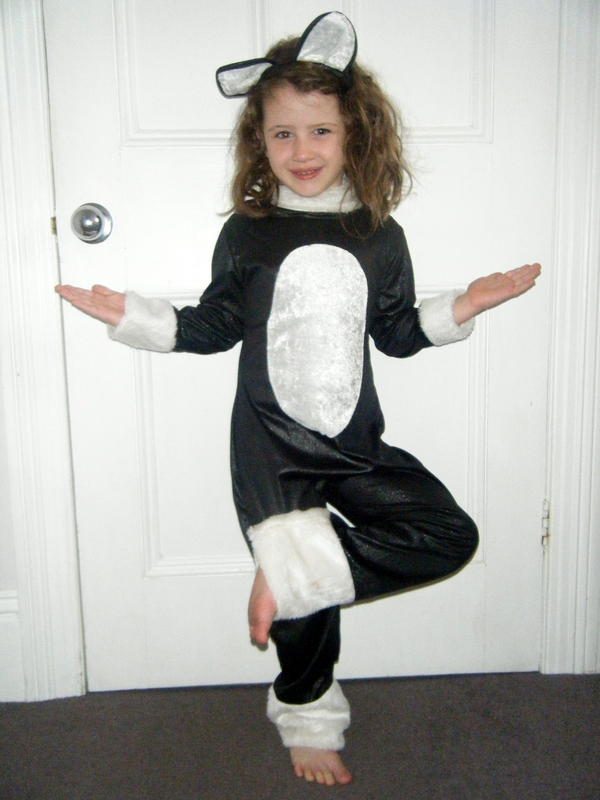 The Halloween Cool Cat outfit that we chose consists of a black shimmery all in one catsuit with a zip up the back, a velcro tail and a headband with ears. The costume was very soft and smooth to the touch and easy to put on. This outfit is suitable for 4-6 year olds and with Miss M just over 4 and half I would say this is the perfect fit. This is a great little dress up outfit which can be used either to be just a cat or a Halloween black cat which we definitely will be this October. So if you are looking out for a fancy dress outfit this year either for yourself or your little ones be sure to check out the vast range at Joker’s Masquerade. You’ll be spoilt for choice – I certainly was! !